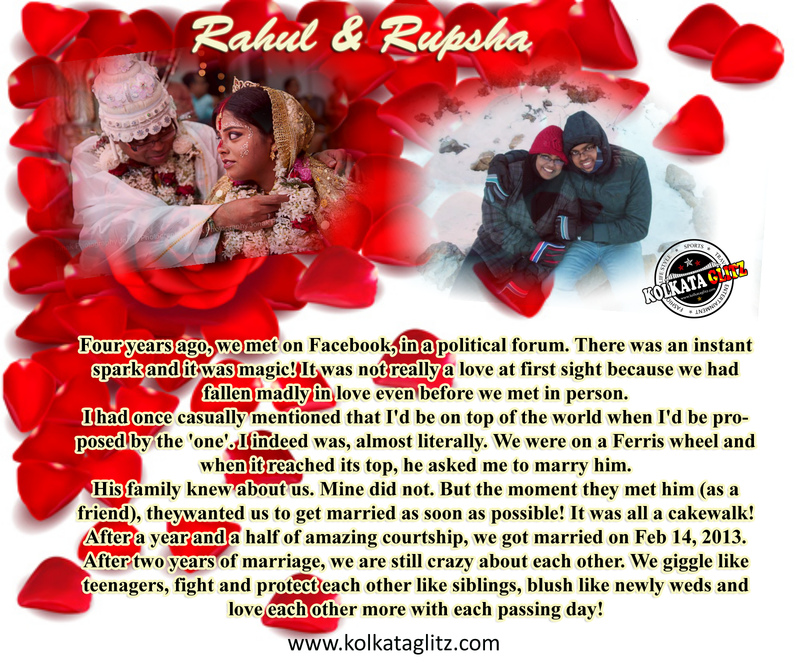 Four years ago, we met on Facebook, in a political forum. There was an instant spark and it was magic! It was not really a love at first sight because we had fallen madly in love even before we met in person. I had once casually mentioned that I'd be on top of the world when I'd be proposed by the 'one'. I indeed was, almost literally. We were on a Ferris wheel and when it reached its top, he asked me to marry him. His family knew about us. Mine did not. But the moment they met him (as a friend), they wanted us to get married as soon as possible! It was all a cakewalk! After a year and a half of amazing courtship, we got married on Feb 14, 2013. After two years of marriage, we are still crazy about each other. We giggle like teenagers, fight and protect each other like siblings, blush like newly weds and love each other more with each passing day!